Katzberry carries a unique selection of urns and vases that will look amazing in any room in your home. Perfect for placing on the fire mantel or kitchen table, our decorative vases can help transform your living space into a peaceful oasis. We also carry a wonderful selection of home accessories, including pillows, stylish mirrors, blankets and throws, and wreaths. Once you find the perfect urn or vase for your home, be sure to browse our quality furniture items, including, bedroom sets, cabinets, chairs and loveseats, display shelves, and more. If you can’t seem to find what you’re looking for in our online furniture store, contact our team. 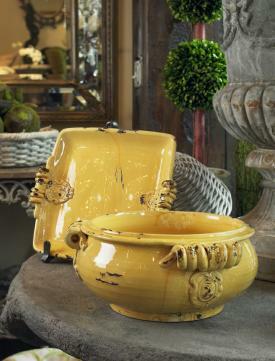 This beautiful Provencal bowl and serving platter has a buttery yellow glaze with hand distressed finish.